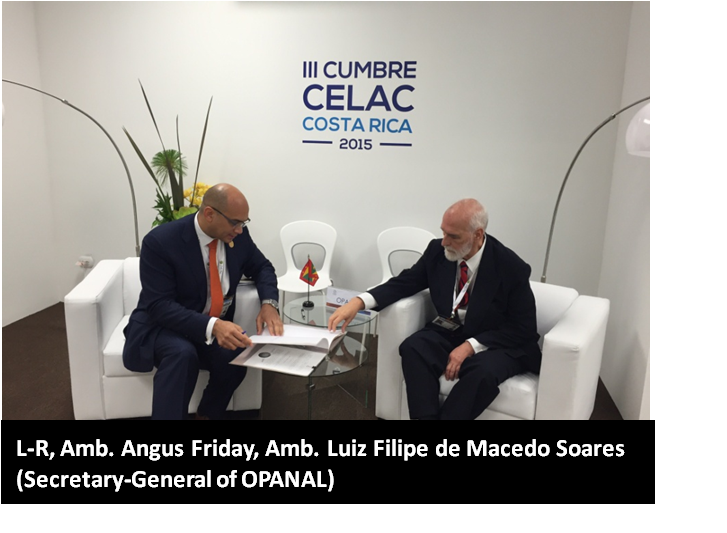 On the margins of the Third Summit of the Community of Latin American and Caribbean States (CELAC), held in San José, Costa Rica, Grenada’s Head of Delegation, Ambassador Angus Friday, signed an agreement with the Agency for the Prohibition of Nuclear Weapons in Latin America and the Caribbean (OPANAL), guaranteeing that organization the privileges and immunities customary to international organizations working in Member States. Grenada has been a full member of OPANAL since 1975. With the signing of this agreement, the International Atomic Energy Agency (IAEA), which assists OPANAL in its mandate to maintain a nuclear weapon free zone in Latin America and the Caribbean, will now be able to offer much-needed technical assistance to Grenada. This latest signing is part of ongoing efforts to ensure that Grenada contributes to the international security regime, particularly as it relates to weapons of mass destruction, and to ensure that Grenada remains one of the safest destinations in the Western Hemisphere.